See graceful Lipizzaner stallions in action. Discover some of the different paces or "gaits" of a horse. Test your knowledge of horses with a quiz. Watch a brief introduction to Western riding. Find out how to sit correctly in Classical style. See the correct body position for Western riding. Discover the difference between direct (Classical) and indirect (Western) reining. Lots of tips on riding in Classical style. What's the story behind show jumping? See jumping highlights from the 2016 Rio Olympics. Watch a video about Olympic show jumping and eventing, with fascinating facts and historical footage. Discover a daring high-jump event known as the "puissance". Watch a horse and rider win a jumping competition. What is dressage and what are the rules? Watch a rider take part in a dressage competition. (Start at 1:45). Watch a world record-breaking dressage performance. Experience a cross-country competition from the rider's seat. Discover the history of Olympic horse riding events. How to groom a pony. A step-by-step guide to mucking out a stable. Find out how to plait a mane. 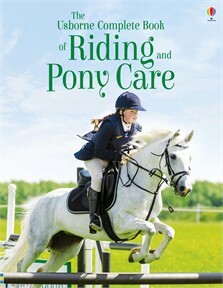 These organizations can help you find out more about riding and pony care, including where to ride, competition rules and requirements, and current safety standards. Many of the Pony Club websites are linked to each other, and also provide links with Pony Clubs in other countries around the world.